This morning started like the others with a quick breakfast, then in the water. The first dive site was called Swim Thru City and although there were many swim-throughs, we didn’t actually swim through any of them. Instead, we spent a couple of minutes checking out a large Coral Clinging Crab. It was tucked into a hole in the rock, that appeared just big enough for it to hide in. When I got out the camera for a photo, it crawled far enough back into the hole that I couldn’t see it. I thought briefly about sticking the camera (and my hand) into the hole for a great photo, but, remembering the size of its claws, decided against the idea. Out on the sands, away from the coral, there was a small field of Garden Eels. They too were fun to watch. From a distance, they looked like grass swaying in the current, but as we approached for a closer look, the grass got shorter and shorter until it disappeared into the sand completely. It’s not until we sat on the sandy bottom and waited that the small eels slowly, cautiously poked their heads out and looked around. We waited long enough to see them come out and start grabbing bits of food that go floating by on the current, all the while keeping a weary eye on us. The other group of fish that let us get somewhat close were those at cleaning stations. We spotted several cleaning stations on this dive where fish would sit on a rock and let smaller fish pick parasites off them. The large fish would open their mouths and the smaller fish would swim in the mouth and out the gills, cleaning all the way. In the ocean where every big fish seems to be trying to eat a smaller fish, it is wild to see these stations where the small fish willing swim into the mouths of bigger fish. 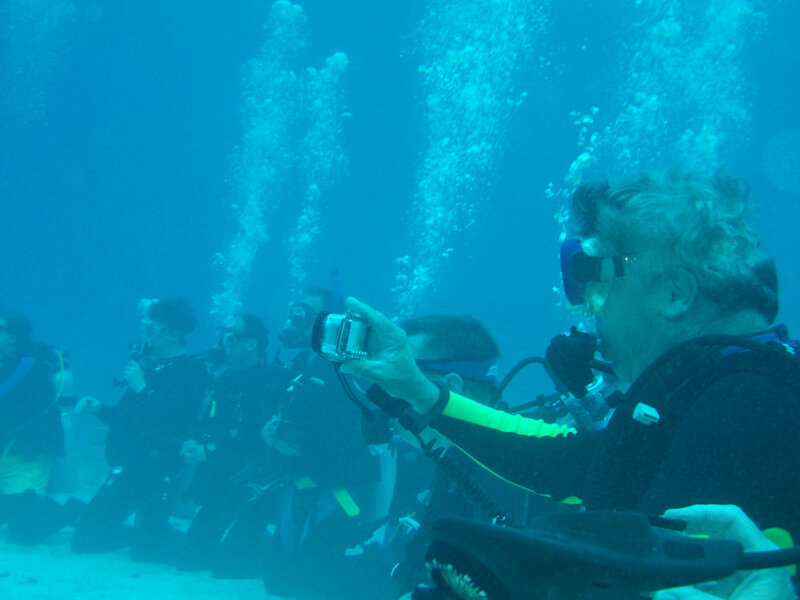 One of the stations on this dive was so popular, two groupers were lined up waiting their turn. The second dive of the day was the obligatory shark dive. As we prepared to jump in the water, the crew pulled out a five gallon bucket with frozen fish bits in it. They drilled a hole through the fishy ice block and tied it to a line. We all jumped in first and got situated on the bottom before the feeding frenzy began. The sharks had clearly seen this show before and were circling under the boat before anyone got in the water. Since we didn’t have food, they mostly ignored us. Once the guide with the chum-cicle dove in, the sharks, trigger fish, remoras, tuna and any other large fish in the area were focused almost entirely on the treat. For safety’s sake, it was on the mid point of a 20-30′ line. At one end was the dive guide and at the other was a float. When she got to the bottom, she clipped the line onto the mooring and got out of the way. For about 10 minutes, all the large sea creatures pecked, nibbled and gnawed at the frozen treat, trying to break off large pieces. In the process, smaller pieces filled the water around them and smaller fish swooped in for the table scraps. Eventually, it got small enough that one large shark came in, grabbed it, shook hard enough to break it free of the line and swallowed it whole. It was cool to watch for 30 seconds, but quickly felt like we were at a zoo. I go diving for the same reason I hike and backpack which is to see wildlife in their natural setting and this wasn’t what I was looking for. On the other hand, it did give me an excuse to sit on the bottom and practice blowing bubble rings (picture smoke rings ascending through the water column). In the middle of the ice pecking frenzy, I managed to get one of my best bubble rings ever. It rose 10-15′ before breaking into smaller bubbles. I often find simple things so entertaining. On the final dive of the day, I spotted two Beaded Crinoids and a Spaghetti Worm, neither of which I had see before. The crinoids looks like delicate sea stars with arms poking out of the rocks. If you touched it (and I would never touch anything underwater, it’s against the law in the Bahamas), it would curl around your finger, sticking to you as if by Velcro. The Spaghetti Worm looked like fishing line. I’m not sure what Bahamian law says about picking up trash which still includes touching things underwater, but I reached out to collect the misplaced monofilament. When I touch it, it didn’t feel as stiff as fishing line typically does, which was odd, but not as odd as the fact that it started contracting and getting pulled back into a hole. It turns out, that’s how these worms feed. They wait for very small things to get stuck on the fishing line-like tentacles, then pull it in for a meal. Rather than going on a night dive, we headed into port at Cape Eleuthera. We feed the Nurse Sharks and Bull Sharks that hang out at the end of the dock where the fish get cleaned, then went for a drink before dinner. After dinner, most of the passengers and crew of our boat join those on our sister boat for a bonfire on the beach. Watching a bunch of sailors, who typically try hard to prevent fires from breaking out, try to light a bonfire was simultaneously entertaining and frustrating. First, a lighter was used, but there was a lack of tinder or kindling so not much lit. Then a can of Off Bug Repellent was used with the lighter as a flame thrower, still to no avail. Next came a road flare, but again, there was little to light. When a can a diesel arrived, I pulled my chair away for the fire pit, but should have leaned in because I was about to see one of the most amazing things ever. The diesel fuel was dumped on the road flare and everyone expected the bonfire to really get going… instead, the diesel managed to extinguish the road flare. I think I knew this was theoretically possible, but never expected to see it happen. Finally, as the group went back for yet another can of diesel, a few of us with more camping experience moved in and got the fire going without any additional materials. After about two hours, we were about to head back to the boat when someone pulled out fire poi. Dom and I have both spun fire once before and when these came out, we had to try again. Had we had a chance to practice before they were flaming and whirling around our heads, we might have been able to remember more of the tricks we learned years ago, but as it was, we each successfully spun (meaning we didn’t die or burn anything down) for a couple of minutes. Such a fun end to the evening. Can’t wait for tomorrow. 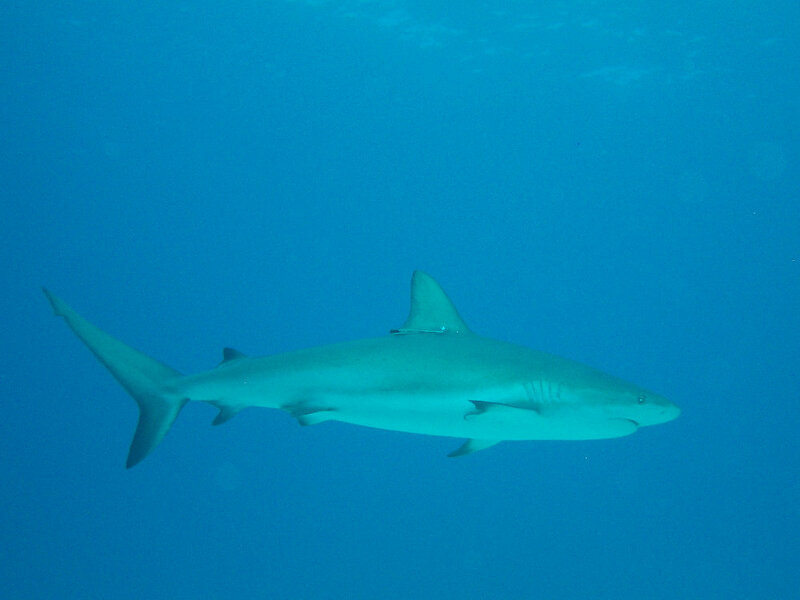 This entry was posted in Travel and tagged Bahamas, diving, scuba, Sharks. Bookmark the permalink. Your days sound like they are just FULL of wonderful events, things to do and other nice things to occupy the simple-minded…I’m kidding! Wish I could have seen the fire poi – I remember you getting the fire sticks for Christmas and putting on a show for us. Nice! We didn’t get pictures, but I think one of the other divers got a video of us spinning. If I get a copy, I’ll be sure to post it. Sounds so crazy and adventurous! I’m a scaredy cat for the most part, so it’s fun to experience these things vicariously through you haha. It was a lot of fun and (after the first minute) really not that scary. The sharks are such powerful, graceful creatures.